The 8-SOP on the board is pretty clearly an AVRciczz, i.e. a clone not a defeater. Yeah Krikzz uses his own region free CIC clone (the NES CIC is quite trivial as I understands it) and if it works for the Everdrive it should work with any game I think. IIRC it's region free and remembers last region just like the Powerpak and Infiniteneslives ones. But Krikzz' converter isn't recommended to be used as a general converter, it's made to fit inside a shell with the Everdrive. I bought that converter from Stoneagegamer and guess what: It's a piece of crap. When I try to use it, the title screen is shown for a moment, then the NES goes into perpetual reset mode, i.e. exactly the thing that it does when it doesn't detect a correct CIC. Since the converter has the Stoneagegamer logo on the front, I thought this is a converter by the homebrew community. But when I opened up the case, I found out that this is just a stupid Honeybee converter. Also, there's no chip whatsoever in the place where the CIC would be located. So, yeah, it might be good enough for a top loader or some clone console. But the Stoneagegamer converter will not work with an unmodified front loader NES. It's just a cheap Chinese product. Well if it doesn't have a CIC it can't be used. You must install a CIC clone. But Krikzz' converter isn't recommended to be used as a general converter, it's made to fit inside a shell with the Everdrive. Is there a reason against using it as a general converter? They're giving me a refund. This one doesn't have a shell. Which is the reason why I don't want to use the original Nintendo converter anymore. The fact that you want a separate shell for it, and the cost of making an injection mold to produce such a shell. Without a separate shell, it's a replacement for NES-JOINT. I don't get why krikzz can't be used for general conversion aside from it's lack of case. Appears that krikzz's is the standard NES PCB outline that should fit in most aftermarket cases, but would still require to be cut in half. Doesn't look as though Krikzz contains any audio mixing circuitry though. 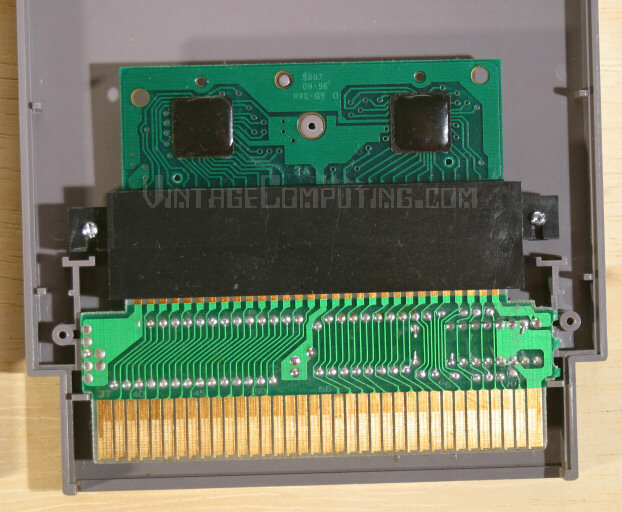 But it does appear that he properly routed CIRAM /CE control to the cartridge. Would it work if I simply take one of those cheap Chinese converters and use the case of that one? Yeah, that was added right after my complaint. They claim that they tested it on a front loader NES, but it cannot work. The left side where the lockout chip would be located is empty. So, I assume their NES already had the chip disabled. After I told this to him, he wasn't sure himself anymore. I mean, on the inside, it's a Honeybee converter. Does any Honeybee converter have a lockout chip or any other defeat mechanism? It's unlikely that the PCB outline of the cheap chinese converter case matches the "standard" NES PCB outline. But it's possible, your guess is as good as ours. Oh, right, that was about the other technical issue, the mirroring etc. Does Nintendo's "Gyromite" converter do this correctly? No bridged pins there, and the 37-72 pin side is the side to look at when identifying the bridging between those two signals. The guy that bought a bunch of them (a post on Famicom World) and didn't recommend them was trying to use them in bare PCB form. If you have a shell and ribbon I bet it's not worse than the Gyromite one or any other shell-less converter. Krikzz made them so that people wouldn't have to cannibalize Gyromite before the 72 pin version of the Everdrive was complete. It was designed to fit inside a standard NES shell like the Gyromite adapter. I don't get why the converter needs to have audio mixing circuitry in the first place? I thought its use is just to convert the pin layout. Isn't audio mixing done inside the game cartridges anyway? On the Famicom the is fed through the cartridge in a loop, one pin in, one pin out. On the NES you can't interrupt the audio path like that, you can only connect to it in the middle via some bridge to that expansion pin, so you can only "mix" with it. The mixing stuff already present in the Famicom cartridge doesn't function the same in this circumstance, you are substituting for it with a passive mix. This is one reason why I recommend using a potentiometer for the common "NES audio expansion mod", rather than a fixed 47k resistor. Different carts will need a different resistance to sound balanced as they were, there's no way to use its original on-cart mixing hardware to do this automatically. Ah I see, thanks that explains everything. I'm pretty sure this goes for almost every adapter that doesn't use donor carts. I know I shouldn't ask this, but why don't you just mod your NES? It takes seconds and no technical knowledge. It's a wonder to me that region protected NES'es still exist. I got this NES almost brand new. And it still looks very new. I will not open it up to alter anything in it. I like to keep it as it is. Well as the CIC is trivial to make with a microcontroller and it's required by some games I don't see why you would bother disabling it.